Weeks ago, I took a four week e-course called Creatively Made, taught by Jeanne Oliver. What an amazing class! I thank God for Jeanne and her wonderful way of encouraging people to be creative. Each week, participants were treated to at least a dozen videos filled with wise counsel, inspiration and instruction by Jeanne and her guest artists. I took the course to learn how to use new materials and art technique but what started out as just an educational pursuit ended up life changing. I had no idea that I was missing such a big part of my life by not making time for art and creative pursuits. I will have to explain this life-changing event in another post. In the meantime, I am finishing up some of the projects inspired by that class. 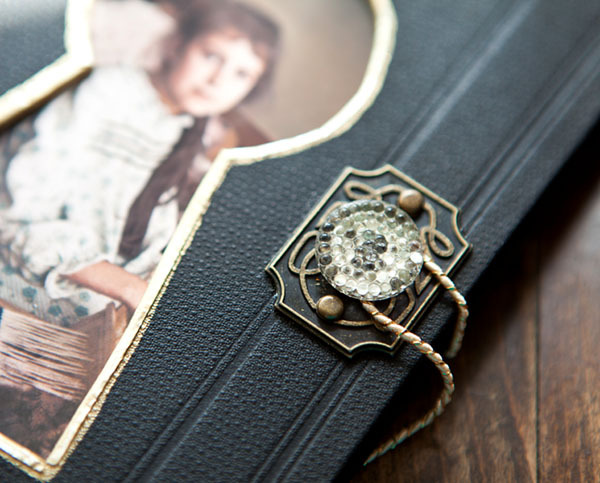 One of the projects was a “Vintage Journal” made from the parts of a vintage book. Altered book projects are new to me. At first I couldn’t bear to tear apart a book. New or old made no difference; destroying any book seems a crime! But once I saw that there were dozens of old books available, some just gathering dust and rotting in used book stores, I didn’t worry as much about using a book for a purpose other than filling my already overflowing bookshelves. This altered book is constructed different than the one taught in the class. I kept the spine intact and connected to the book covers. To add a text block in the book, I used ribbons to tie in the pages, 3-ring-binder style. Vintage Journal - An altered book made from a vintage theology text in German. My paternal Grandfather was a preacher of Pennsylvania Dutch and German heritage so this particular book is a lovely tribute to him. Alas, I can’t read German so I’m saving the pages and hoping to get some of them interpreted so I can incorporate them into the book. 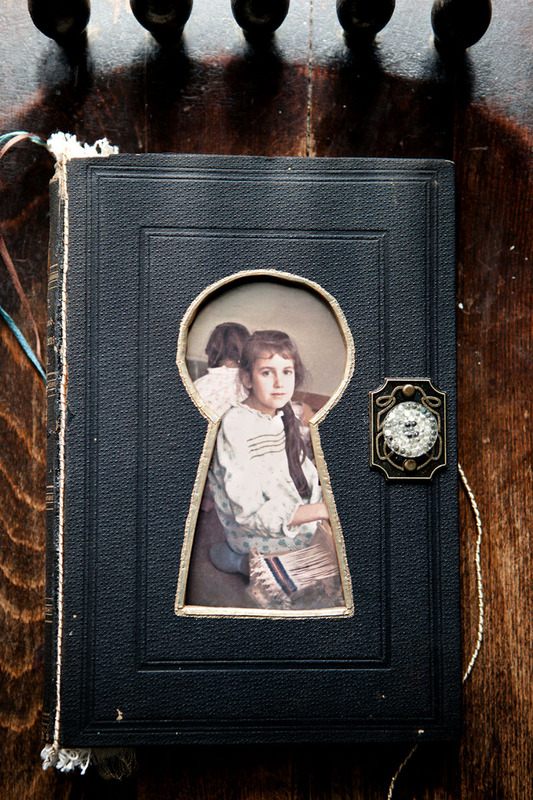 Vintage Journal - The closure is a miniature metal keyhole plate. The doorknob is an old glass button from my Grandma's button tin. 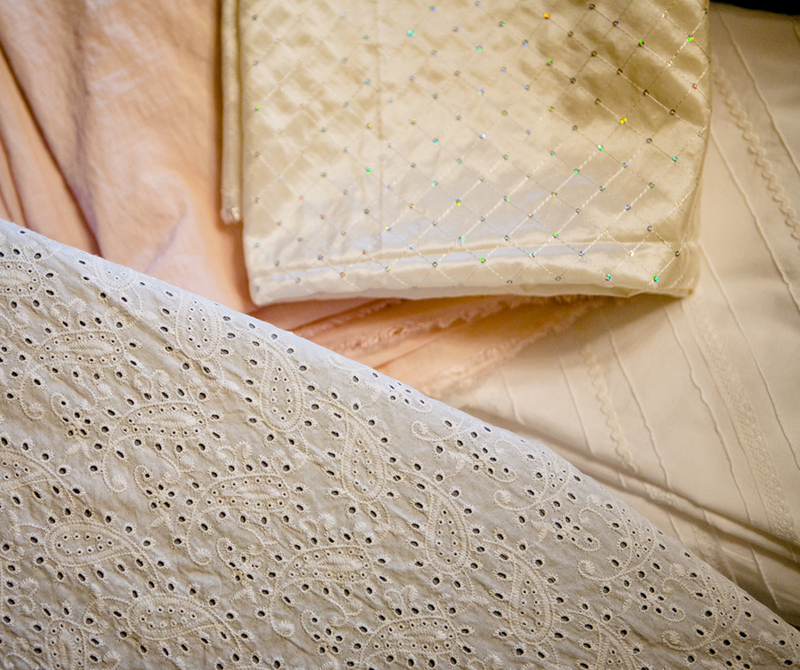 I'm always happy when I can include a little item that belonged to my Grandma. Vintage Journal 1 - Pages removed, keyhole shape window cut in the front cover. 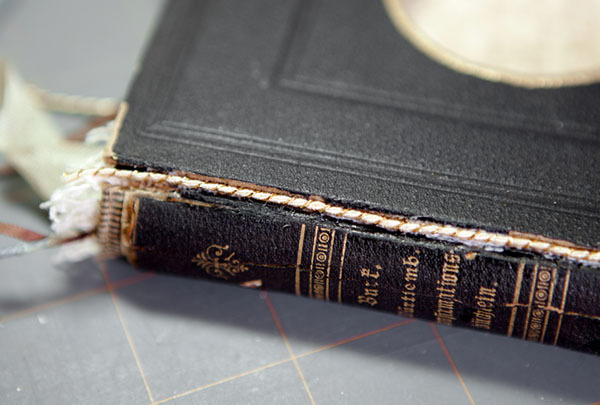 The original book pages were stapled and glued into the spine so they were pulled out. I cut a keyhole-shape in the front cover. To finish the edge, I used 1/4″ silver foil tape and then painted it with gold acrylic paint. 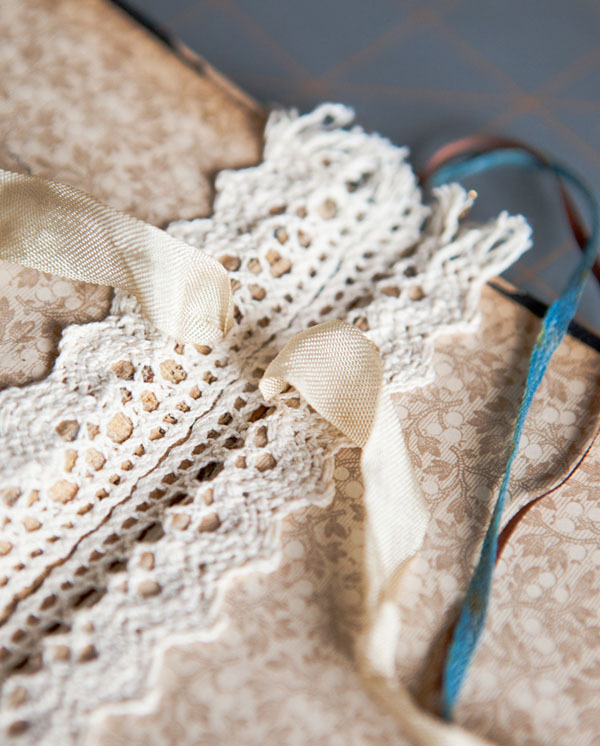 Vintage Journal 2 - Ribbon and lace glued inside the spine. 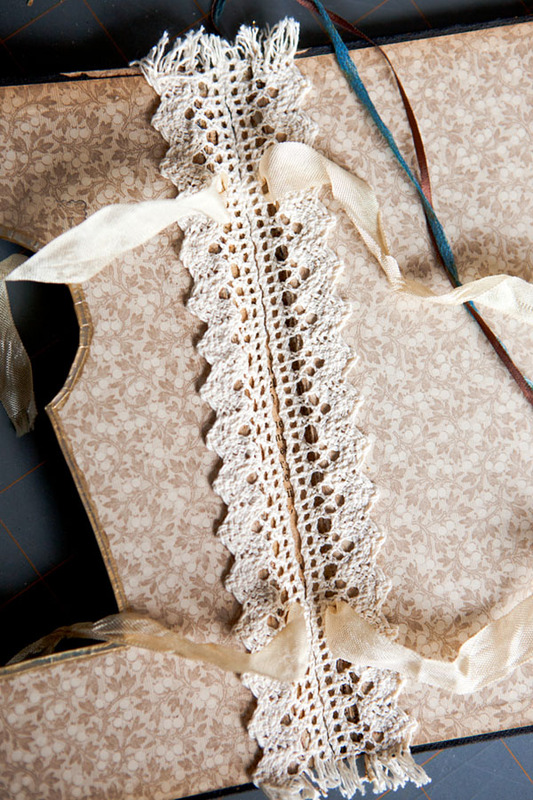 Inside the spine, I glued two strips of lace through which was threaded ribbon to tie in the pages. 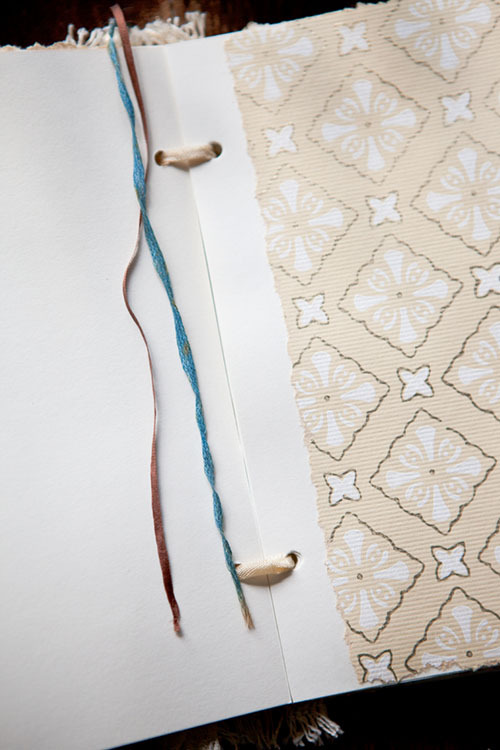 I also added a brown silk ribbon at the top to reinforce the thread-bare blue ribbon original to the book. 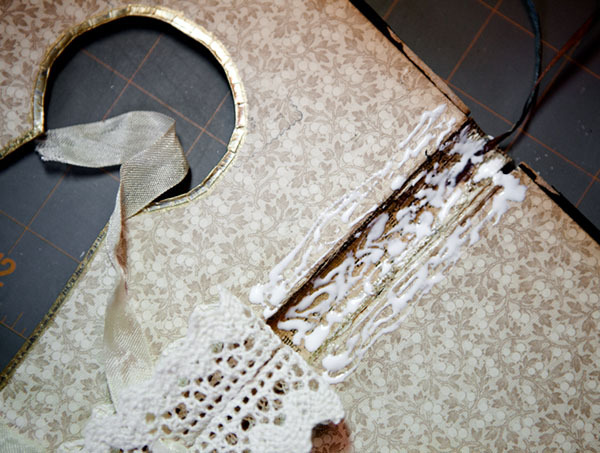 Vintage Journal 3 - Lace with ribbon glued inside the spine. 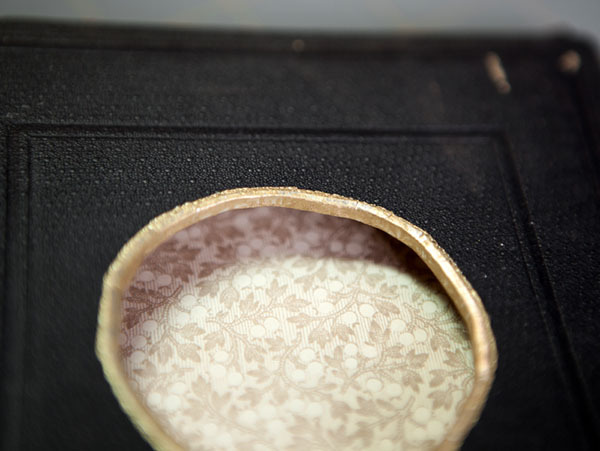 Vintage Journal 4 - The lace inside the spine reinforces the weak joint between the covers and the book spine. Vintage Journal 5 - There was a gap between the book covers and the spine. 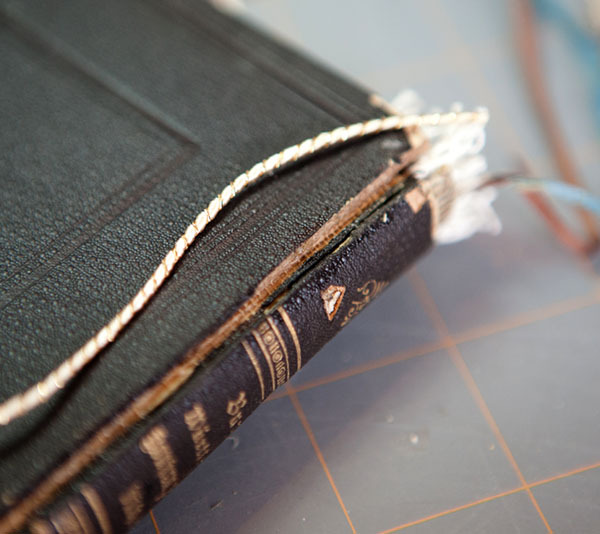 Vintage Journal 6 - Thin gold-wrapped cord glued into the gap between the book covers and book spine. Vintage Journal 8 - I cut pages of creamy sketchbook paper. I also used pages torn from a vintage wallpaper book but knew they could not withstand a hole punched joint. So they are glued to small strips of hole-punched sketchbook paper. 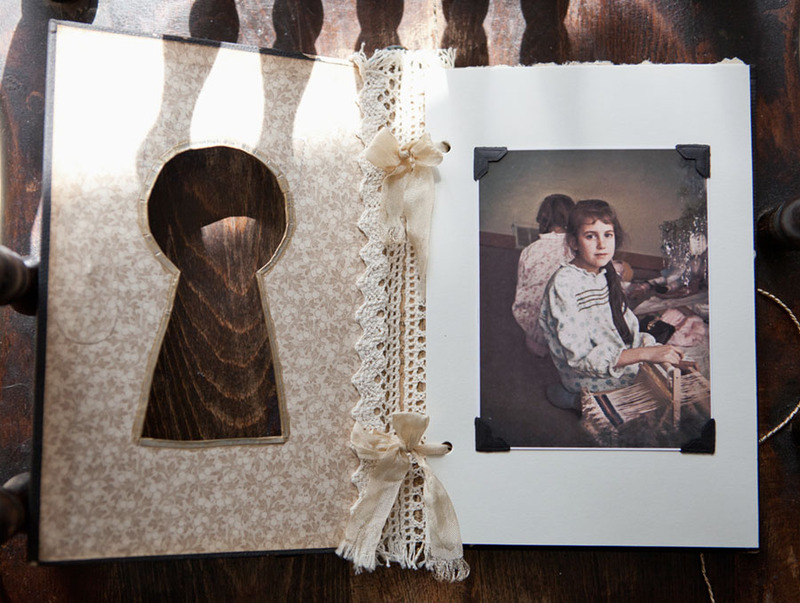 Vintage Journal 8 - I love the look of the deckle-edge wallpaper pages interspersed with the sketchbook pages. 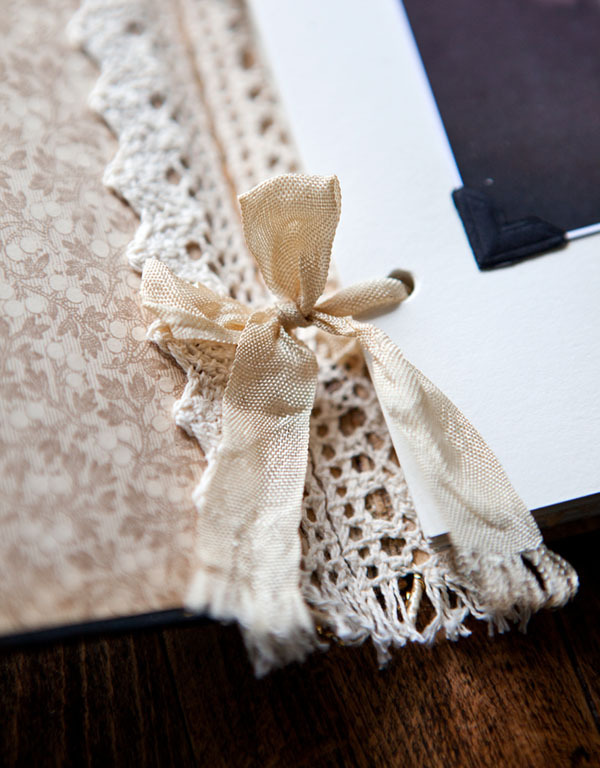 Vintage Journal 9 - The bow must be tied close to the front cover, not the text block. 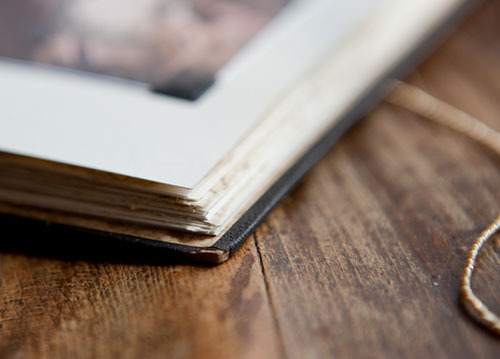 This allows enough slack for the pages to slide along the ribbon and open fully. Vintage Journal 10 - I have very few photos from my childhood so I cherish this one from Christmas Day, 1967. Alas, my little sister Donna is turned away from the camera. I love that she is there, even if I can't see her sweet face. I am very happy with how this turned out. It looks as old as I wanted it to. The book was published in 1884 and I wanted to preserve the stark elegance of it but still make it mine. I’m looking forward to adding small sketches, paintings and writings to the pages.